Kokuyo S&T Co. Ltd., Japan (Kokuyo Co., Ltd.) acquires a majority stake in Camlin Ltd. and rechristens the company Kokuyo Camlin Limited. Kokuyo is a Japan-based company with more than a 100-year-old history. It is a leading marketer in stationery, institutional furniture, and catalogue sales and has its presence in many countries throughout Asia. Kokuyo is proud to share the legacy of our long-standing relationship with brand Camlin and add value to it. The All-India Camel Colour Contest is entered into the Guinness World Records as the Largest Art Competition with the participation of 48.5 lakh students from across the country. Camlin opens its first module pre-school in Mumbai, Camlin Alphakids Ltd., a 100% subsidiary of the company. Camlin is listed on the National Stock Exchange. Camlin introduces a new, state-of-the-art plastic body range. 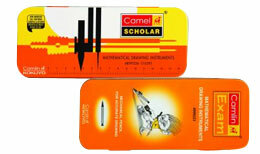 Camlin Exam, a premium quality stationary brand is launched. Camlin launches a specialty ink group to engage the R&D expertise in ink development and manufacturing. Camlin is recognized as an export house by the Ministry of Commerce, Govt. of India, for its outstanding export performance. A tour to Europe and visits to famous art galleries is organized by the Camlin Art Foundation for the selected winners of the Camlin Regional Art Contest and the Art Teachers Art Exhibition. The year also saw Camlin Fine Chemical Division being awarded the prestigious ISO certification. The first Art Teacher's Art Exhibition is held in recognition of the unique role teachers play in nurturing creativity in children. A state-of-the-art gel pen plant begins operations in Mumbai. Artica, water mixable oil colours are launched for the first time in Asia. Glass colours are introduced into the Hobby range. All-India Camel Colour Contest is entered into the Limca Book of Records for the highest number of entries received. The All-India Camel Colour Contest, the most popular art contest for school children, blazes new trails with a staggering 3 million entries received. The Camel Art Foundation, a platform for artists and students to display their talents, is also launched. Restructuring the organization to meet the challenges of the millennium. Technical collaboration with Pilot Corporation, Japan, for the manufacture of 0.5mm high polymer leads is established. Camlin becomes a Public Limited Company and is listed on the Bombay Stock Exchange. A year of diversification. The Camlin Fine Chemical & Pharmaceutical Division is born. A new integrated, ultramodern plant is started in the Tarapur premises to manufacture bulk drugs, intermediated and anti-oxidants for the global market. Wooden Pencils are introduced. A fully integrated factory is started in Tarapur (100kms from Mumbai) for the manufacture of wooden pencils. Camlin enters the art material market with the launch of quality products for professionals and students such as oil colours, water colours, poster colours, wax crayons, oil pastels, and geometry box sets. A silver jubilee year, celebrated with great enthusiasm in its own factory and office at Andheri, which is now the Head Office for all divisions. Independence and the beginning of the Camel era. From inks the product range expanded to pain balms, chalks, rubber stamps pads, gums, adhesives and a range of stationery products. Simultaneously a distribution network was being set up to reach across the length and breadth of the country. Dandekar & Co. is re-christened Camlin – a combination of Camel and Ink. Camlin moves into a brand new centrally located office and factory at Mahim (Mumbai). Operations start with Horse Brand Ink Powders and Tablets. This is followed shortly by Camel Ink. The "Camel" was chosen as the symbol due to its capacity to endure long periods of difficulty on trips across deserts. "Camel" was also easy to write and pronounce in all the Indian languages and was acceptable to all the regions of the land.